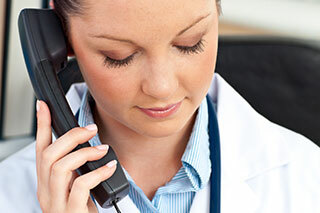 Providing telephone support to patients. “Although there are patient-reported advantages to phone disclosure, longitudinal data and evaluation of the impact on health behaviors is needed before widespread adoption of phone communication for disclosure of genetic test results, particularly in the era of multigene testing,” said Angela R. Bradbury, MD, University of Pennsylvania Perelman School of Medicine, Philadelphia, Pennsylvania, on behalf of the Cogent research team. Genetic testing for cancer predisposition traditionally includes both in-person pretest and posttest genetic counseling, however, “outcomes of telephone delivery of a range of cancer genetic test results, including multigene panel testing, are unknown,” she said. To test the effects of telephone disclosure, the study approached patients at 5 centers in Pennsylvania, New Jersey, and Illinois from December 2012 to October 2015 who were undergoing cancer genetic testing after in-person, pretest counseling. A total of 1178 consented and 970 were randomly assigned to in-person (n = 497) or telephone disclosure (n = 473) of results. A total of 208 patients (18%) declined randomization, stating a preference for in-person disclosure. The primary short-term outcomes were genetic knowledge, state anxiety, and general anxiety. Results showed that telephone disclosure was not worse than in-person disclosure for general and state anxiety, “but did not reach the noninferiority threshold for knowledge,” she said. No significant differences were observed in outcomes between arms, nor did the information provided change behavioral intentions. If the result of genetic testing was positive, general anxiety was significantly higher in the in-person, or usual care, arm compared with telephone disclosure, +0.87 versus –0.37 (P = .020). In general, “short-term distress is not worse with telephone disclosure of genetic test results,” Dr. Bradbury said. “There may be inferior gains in knowledge and some patients still prefer in-person communication. 1. Bradbury AR, Patrick-Miller LJ, Egleston BL, et al. Patient-reported outcomes in a multicenter randomized study of in-person versus telephone disclosure of genetic test results for cancer susceptibility. Oral presentation at: ASCO 2016 Annual Meeting; June 3-7, 2016; Chicago, IL.